How do I add a scheduled report? 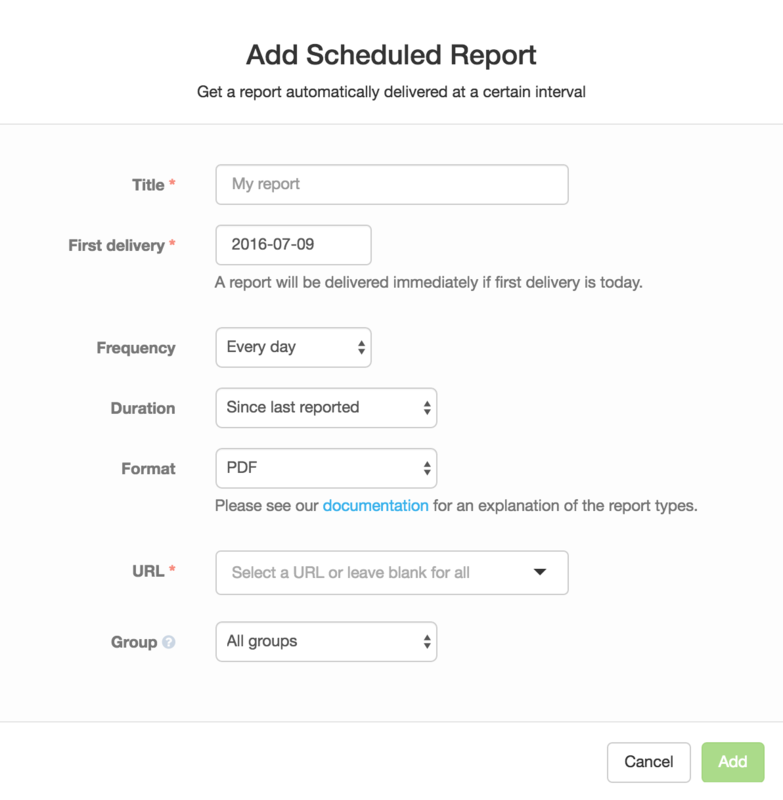 The "Add Scheduled Report" button allows you to create a report that will repeat at various intervals. For example, you might want a PDF report delivered to you every week. This kind of report is useful in conjunction with the client functionality of Serpfox. It allows you to set up a client account so that they receive a report at the interval they request. When you click on the "Add Scheduled Report" button you will be presented with a modal dialog. Title - A title for the report. Something descriptive will help you identify the report later on. First delivery - Specify the date the report should first be delivered. If the first delivery is today, a report will be generated immediately and then according to the frequency. Frequency - How often the report will be generated and delivered. Duration - The period of time that the report should cover. Since last reported means that the report will include the period of time from the previous delivery until now. Format - Determines the reports contents. A full description of the available formats is available here. URL - Limit the keywords included in the report to a specific URL. Group - Limit the keywords included in the report to a specific group. This can be combined with the URL field to limit keywords to a specific URL in a specific group. The reporting system is flexible, but it has quite a few options. If you need any help, feel free to contact us!